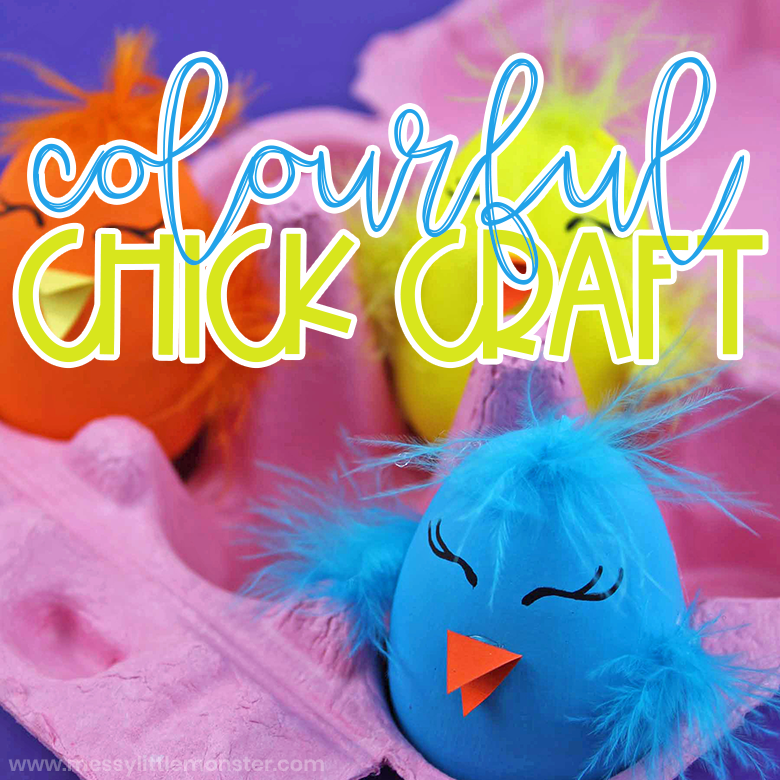 This chick craft is such a fun Easter activity for kids! 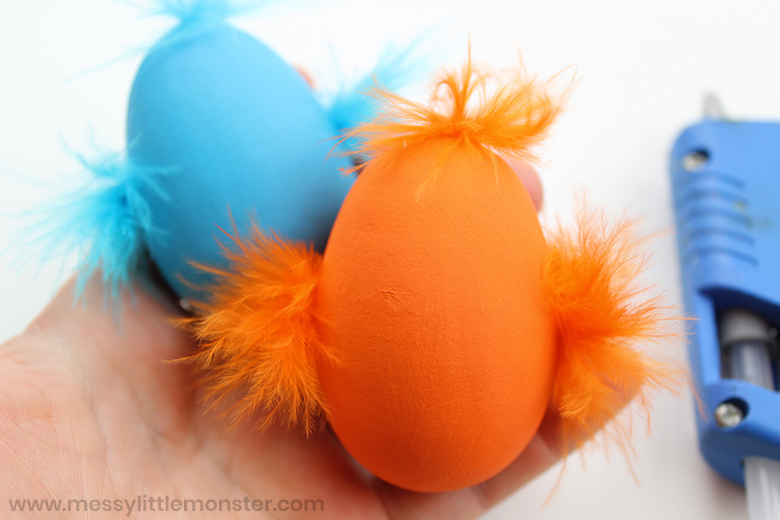 Young children will have a BLAST making this fun Easter craft. 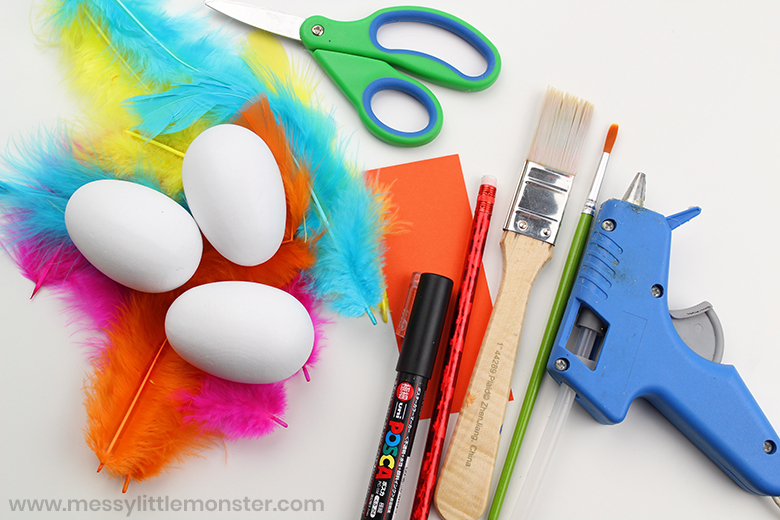 It features painted wooden eggs - which make this Easter chick craft the perfect amount of fun. Just follow our step by step directions below to make your very own! For even more fun Easter chick crafts, be sure to check out this chick paper doily, this chick cake in a jar, or this chick themed sensory bin! 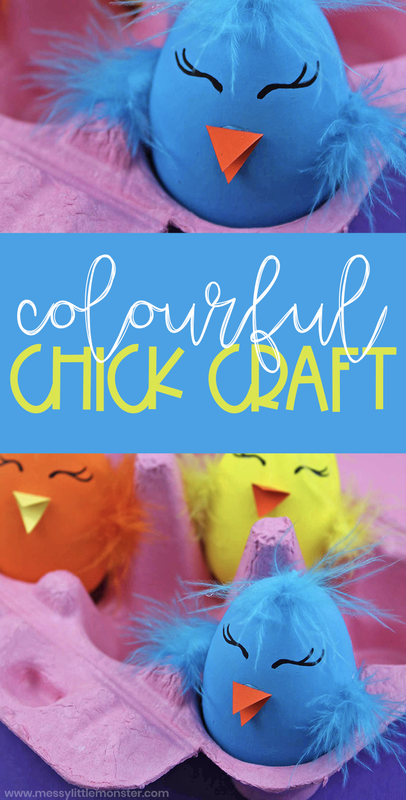 The colourful chick craft that we are sharing today is the perfect activity for playdates, parties, and in the classroom. 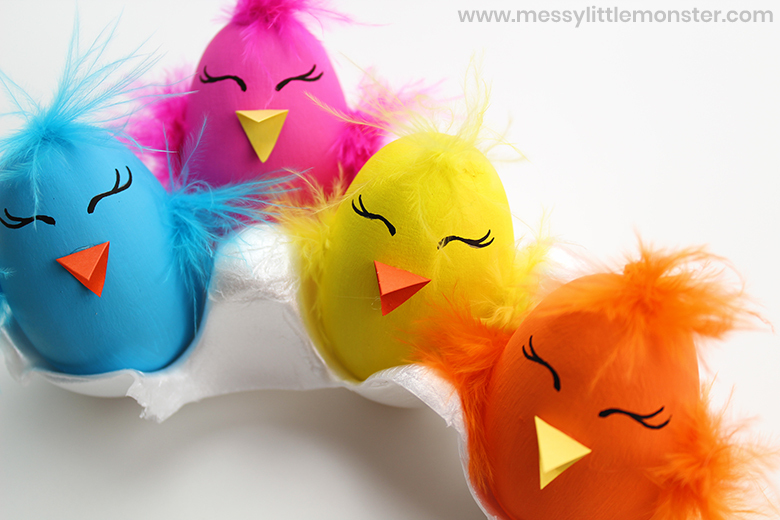 Or even just as a fun Easter chick craft to do with your kids or grandkids. Toddlers and preschoolers as well as big kids will have lots of fun helping with these painted eggs. We painted wooden eggs but you could also make this craft using real eggs if you prefer! Just scroll down below to get started with your own Easter chick craft made from painted wooden eggs! I have provided product links for your convenience. We are a participant in the Amazon Service LLC Associates Program, an affiliate advertising program designed to provide a means for us to earn fees by linking to Amazon and affiliates sites at no cost to you. Before you get started, gather up all your supplies. It's much easier to have it all rounded up before hand so you're not running around while your kids are waiting. 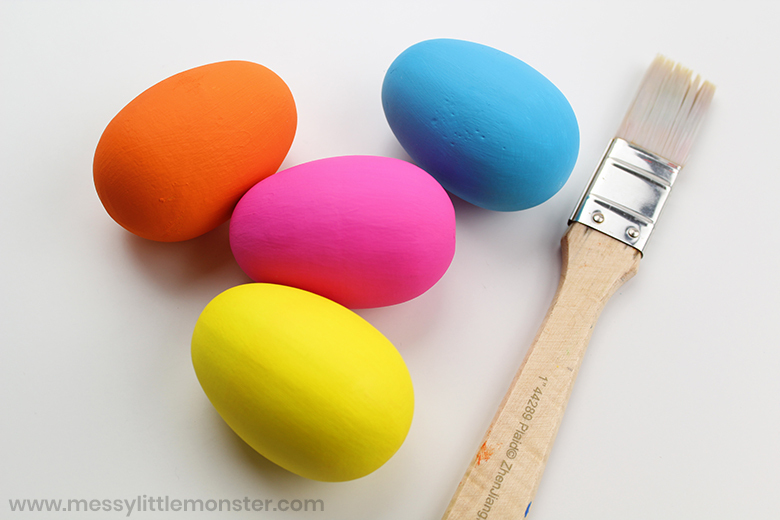 To get started, paint the wooden eggs in the colour of your choice. To get the bold bright colours shown below you will need roughly 2-3 coats of paint. Be sure to allow ample time to dry in between each coat and after the last coat is applied. If doing this craft with younger toddlers they may be happy with just the one coat of paint. Next, cut small bits of feather to glue onto the side of your egg. We chose feathers to match the colours of our eggs, but you can see what combinations your child decides to go with! A rainbow Easter chick would be fun! Continue adding more feathers until you are satisfied with the fullness of the wings. You can also glue on an entire feather to the side if you prefer! To finish off your chick craft, draw some eyes with a pencil and then trace over them with a black paint pen or marker. Younger children may prefer to use googly eyes! Then, cut a small diamond shape out of orange or yellow cardstock to make the beak. Fold it in half and glue onto the face. There you have it, an adorable and colourful Easter chick. Why not make a whole set! 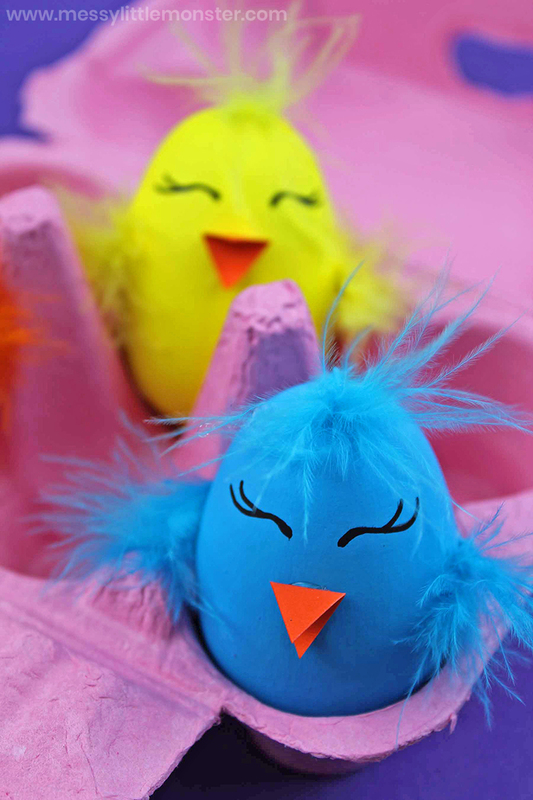 We hope you enjoy making this fun Easter chick craft! It's such a fun activity that toddlers and preschoolers as well as big kids are sure to love. 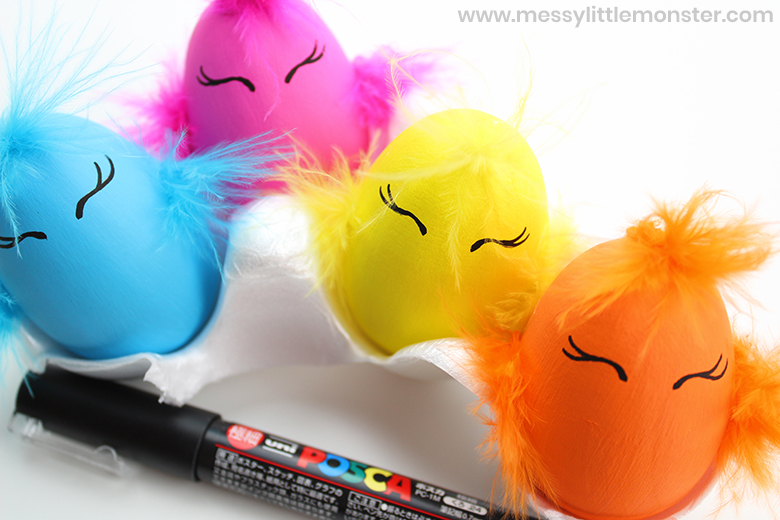 The painted wooden eggs paired with the fluffy feathers are sure to get kids excited for Easter. We hope you have a blast! !